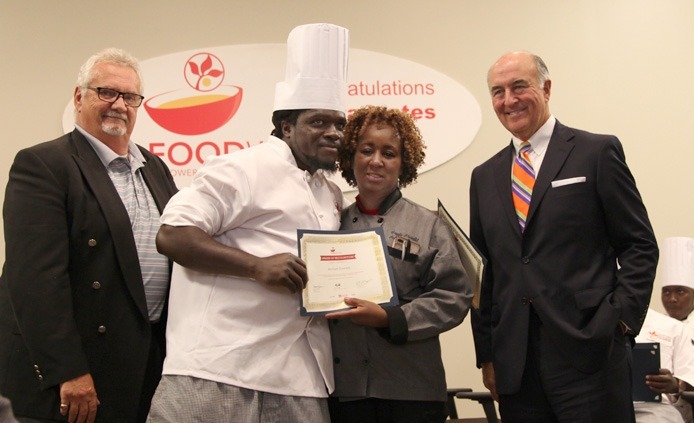 FoodWorks Class 28 students came to our intensive 12-week culinary training program from a variety of backgrounds, having overcome their own individual hardships. 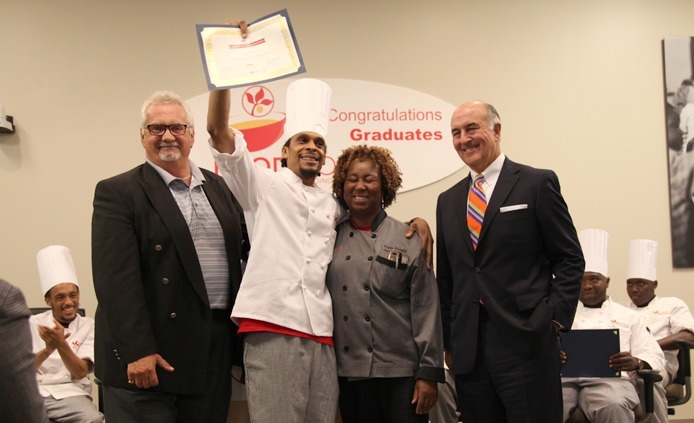 They leave as graduates with ServSafe Manager certification, job readiness skills, and a new direction – one that leads to self-sufficiency. Here are some of their stories. Michael’s smile was a constant throughout the 12-week culinary training program. Whether in the classroom or cooking in the Charles T. Bauer Community Kitchen, Michael was smiling. It was one of those genuine smiles that spoke of true happiness. Up until I sat down with Michael, I didn’t realize that smile was a result of overcoming more hardships than most of us can imagine. Michael lived with family members in Las Vegas until an unexpected call brought him back to Baltimore — his mother had passed away. He flew back to pay his respects. What Michael didn’t realize was that the next several years in Baltimore would be the most challenging of his life. Michael admitted that food insecurity was an ever-present reality for him during that time. 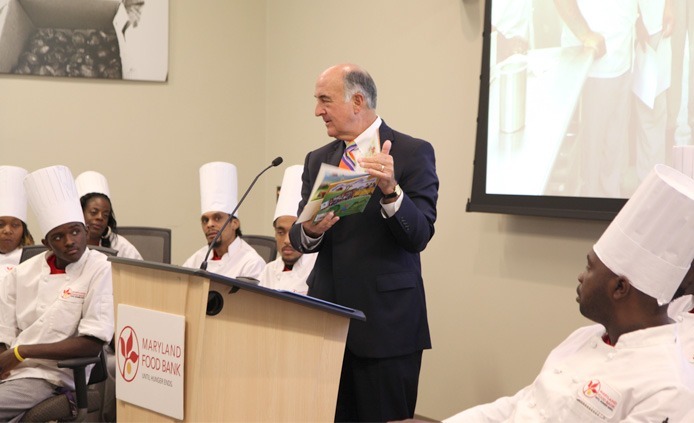 His personal experience with hunger heightened his enthusiasm for FoodWorks — during the program, he was not only able to receive his ServSafe Manager certification and job readiness training, he was also able to help produce thousands of meals for food-insecure Marylanders. “I wanna eventually help build some soup kitchens up. I always see that in my future. I used to attend soup kitchens a lot. That was my main source of nourishment,” he said. Like Michael, Deanna felt the pangs of hunger from a young age. “This program gives me a chance to give back because I know what it’s like to be in that situation,” she said. Despite everything Deanna went through, her desire to give back is ever-present. Throughout her time in FoodWorks, Deanna worked at a 7-Eleven. Shift after shift, she would see the same people — people she got to know and helped despite having so little herself. “Even with a couple of the prostitutes, I try to help them as much as I can. I will ask if they are ok or if they need anything,” she said. 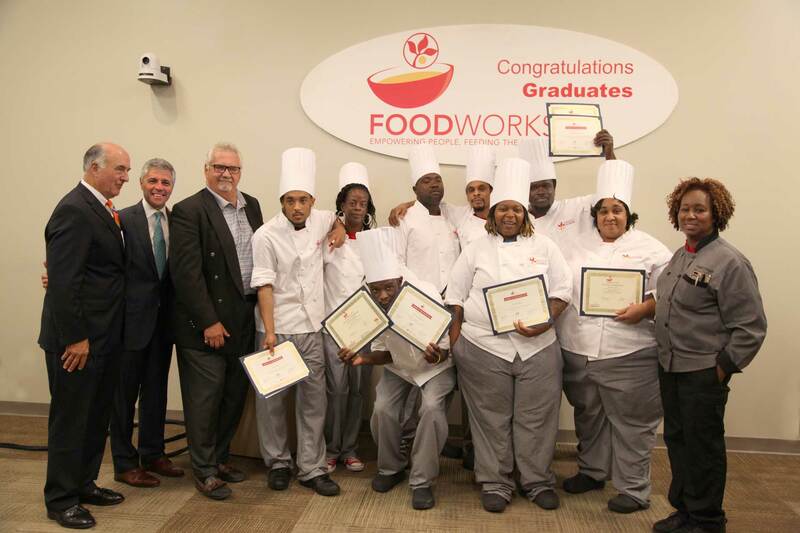 For some of the graduates from FoodWorks Class 28, the only motivation they needed to complete the program was to make those closest to them proud. Damon’s early adult years were punctuated by life on the streets and a prison sentence. The catalyst for changing his life was having kids. “Once you see their faces and their smiles, you know that they didn’t ask to come into this world and that the Lord blessed you with being able to have these children. And that responsibility kicks in,” he said. Damon’s desire to provide a better life for his kids was realized thanks to the FoodWorks program. Within days of starting the culinary training program, Damon got employed. He’s not only providing for his family, but he’s also making them proud. When it comes to FoodWorks Class 28, Secretary Gill’s assumption couldn’t have rung truer. Each graduate embodies what it means to persist. In fact, persistence is the motto Donald — one of the younger graduates — lives by. “I like to have the mentality that nothing can bring me down. Everything that happens, you just gotta look at the positives, and see how it makes you better,” he said. 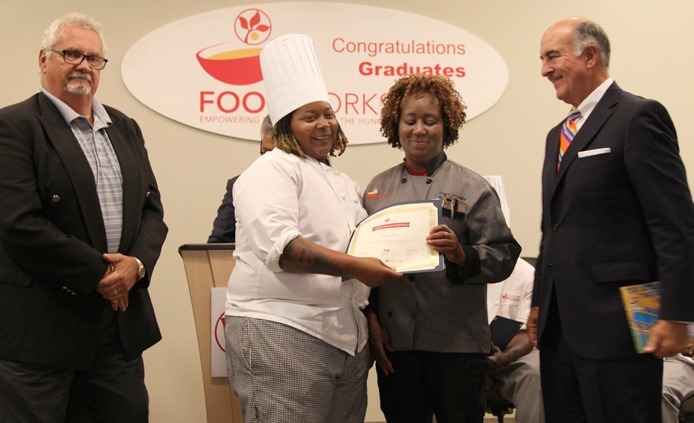 Through persistence, graduates from FoodWorks Class 28 are not only making their own lives better, but they are also bettering the lives of their families and their communities. If you or someone you know could benefit from our FoodWorks culinary training program, apply for one of our upcoming classes. Thank you for sharing your story with us! We’re glad to hear that you are doing well, and your desire to give back to the community is truly inspiring. I went through an experience that had humbled me for the rest of my life. I was very close to becoming homeless in Corpus Christi, Tx. Friends come and go. If it were not for my family’s support there is no telling of where I would end up. I came back to Baltimore with just the clothes on my back. I had to move back home with my son who was barely two. I had to go through DSS to get back on my feet. I took advantage of the back to work programs, eventually I found a job with the State of Maryland. There used to be a volunteer program through Constituents Services where the employees could perform volunteer services. There was my chance to give back to a community althiugh it was not in Corpus Christi. This is a awesome! Congratulations to everyone especially Damon. Keep up the great work guys and I look forward to tasting everyone’s cooking!